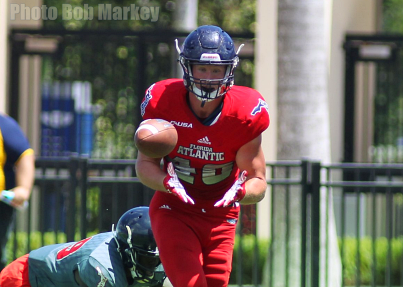 The Florida Atlantic University Spring Game saw the game end in dramatic fashion with the Red Team taking a 17-16 victory. With the Grey Team driving, time out was called twice by Red Team Head Coach Monte Kiffin in attempt to ice the Grey Team kicker. The 44-yard field goal attempt sailed wide giving the Red Team the win and a Monday steak lunch, while the Grey Team, led by defensive coordinator Glenn Spencer, took the loss and will enjoy hotdogs and beans. “It’s tough to run the ball with a second half stud. I thought in general, the defense played really well", said Head Coach Lane Kiffin. Quarterbacks Nick Tronti (16-32, 160 YDS, TD) and Justin Agner (12-32, 266, 2 TD, INT) each posted 32 passing attempts on the afternoon, with Agner coming alive for 231 of his 266 total yards in an impressive second half showing. He also posted the best threat from the ground, with 44 yards on eight carries to that of Tronti's -11 yards on three attempts. Tight end Harrison Bryant (pictured) finished the day with four catches for 99 yards to go with a pair of scores, while WR John Mitchell, who only played the second half, tallied a game high 148 yards on three hauls and a pair of scores as well. From the defensive side, LB Akileis Leroy enjoyed a pass breakup, 2 TFL, and a sack. Diashun Moss, Ahman Ross, and Teja Young each snagged an interception on the day. Kickers were split across the two rosters, with Christian Hoyos (1-1) and Vladimir Rivas (1-1) each connecting from 40 yards out while missing from 44, and 50 yards respectively. With just three sessions left on their spring schedule, the Owls will take to the Oxley Fields on both Tuesday and Thursday for closed practices before concluding action with another scrimmage on Saturday which will also be held at FAU Stadium and will be open to the public. Florida Atlantic will look to begin their 2019 regular season schedule on the road against perennial power Ohio State on August 31st. Kick-off time is yet to be announced.